Travel brochure 10×21 Oslo Biking Tours. This year, we are launching a new bike repair shop and the manager of that shop has put together a brochure for it. However, it just doesn’t look quite good enough for print. I was wondering if you could spend a couple of hours to make it look a bit more professional and then load it into the required template. Here is the file. The boxes are inconsistent, the text is different sizes and in general it just needs to look more consistent. It is a two-sided brochure, 10×21. I am not even sure you need the template no something that simple as I have printed before without using the template on that size. But if you need the template, I can send it. 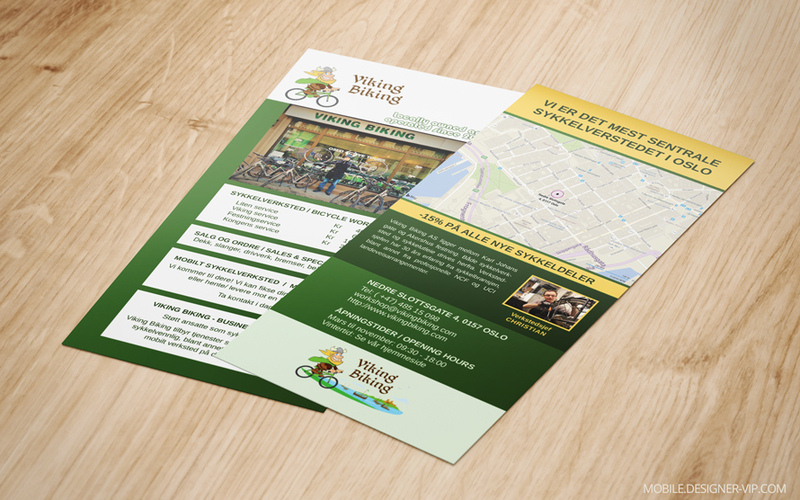 VIKING BIKING – locally owned and operated since 2012. Dekk, slanger, drivverk, bremser, bekledning, osv. eller hente/ levere mot en liten avgift. Støtt ansatte som sykler til jobben! mobilt verksted på din arbeidsplass. Viking Biking AS ligger mellom Karl Johans gate og Akershus festning. Både sykkelverksted og sykkelutleie drives herfra. Verkstedsjefen har 30 års erfaring fra sykkelbransjen, blant annet fra profesjonelle NCF og UCI landeveisarrangementer. Created high quality trifold brochure for a company with turn round – ~3 days. If you need a brochure designed for your company our studio can help.